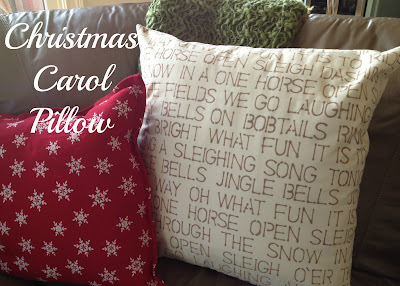 A while back, I found a tutorial on Pinterest for a stenciled pillow from Wit & Whistle. When I was trying to come up with some quick and easy pillows to decorate for Christmas, that pillow popped back into my mind and I decided to make my own Christmas carol version. I started with some plain muslin and cut two identical squares to fit my pillow form. 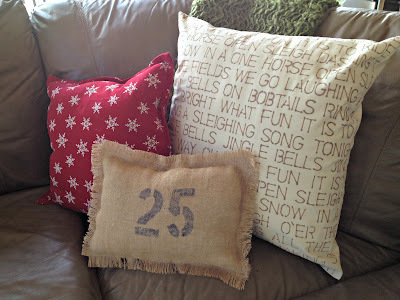 I was using a large 24″ pillow that easily be moved to the floor for extra seating. I used painter’s tape to secure the front of my pillow cover to my table. My stencil is a very basic 1 1/4″ stencil from Hobby Lobby and I used a brown permanent marker for my letters. I then used another strip of painter’s tape to keep my lines straight. Each time I was ready for a new line, I just moved my tape. After an episode of Mickey Mouse Clubhouse, I had my Jingle Bells lyrics complete. I ran my words off the edge of the fabric, knowing that some would be cut off anyway when it was sewn together. side. This was a quick project — my favorite kind! Thanks for having me, Missy! I hope all of the So You Think You’re Crafty readers have a very merry Christmas! Love your pillows. Pillows always add that little ‘extra’ something special. You done a great job. I love this idea! You have a lot of patience and it sure paid off! Great project!